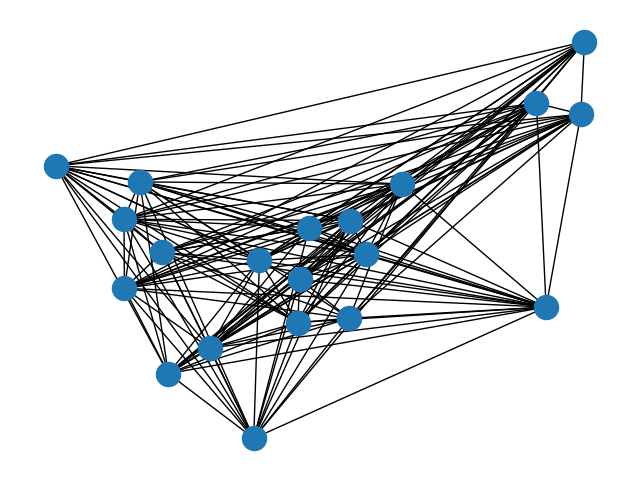 Complement graph class for small footprint when working on dense graphs. This class allows you to add the edges that do not exist in the dense graph. However, when applying algorithms to this complement graph data structure, it behaves as if it were the dense version. So it can be used directly in several NetworkX algorithms. This subclass has only been tested for k-core, connected_components, and biconnected_components algorithms but might also work for other algorithms. an instance of this class with some of NetworkX functions. """Return a dict of neighbors of node n in the dense graph. """Return an iterator for (node, degree) in the dense graph. The node degree is the number of edges adjacent to the node. as a weight. If None, then each edge has weight 1. The degree is the sum of the edge weights adjacent to the node. This is the fastest way to look at every edge. For directed graphs, only outgoing adjacencies are included. # as if it were the original graph.